AT&T’s Network Transformation Just Got More “Real” – But Still Too IT Light? AT&T announced a commitment to “virtualize and control” at least 75% of its network via its User-Defined Network architecture by 2020. Absent from the Domain 2.0 roster of vendors supporting this new architecture are any major IT vendors or integrators, something AT&T may come to regret. In many ways, this is not surprising. AT&T is one of a handful of operators actively driving SDN and NFV forward – paving the way for others to follow. It only makes sense for the operator to “put its money where its mouth is.” What’s more, this aligns nicely with recent research we’ve done. Surveying 100 service provider executives, for example, the faster service rollout implied in AT&T’s Network on Demand solution was cited by 92% of operators as an SDN investment or deployment priority over the next three years. And yet, there was a somewhat surprising aspect to the news. Specifically, in a conference call with select media and analysts, Donovan commented that he didn’t expect AT&T to be adding new vendors into Domain 2.0. He didn’t rule out the inclusion of more vendors, but he suggested that they’d likely come in via (integrated by) existing suppliers. And that suggests we’re unlikely to see the addition of any major IT suppliers such as Dell, HP, IBM, or Oracle. This isn’t to say that the current Domain 2.0 suppliers don’t maintain IT expertise. And AT&T isn’t alone in favoring telco vendors over IT vendors when it comes to SDN/NFV deployment and integration; almost two-thirds of carriers surveyed in our recent primary research expected telco vendors to take the lead in supplying SDN/NFV software and integration services. And yet, that doesn’t mean that this isn’t potentially short-sighted. For service providers, SDN and NFV are, ultimately, about the integration of IT principles, assets and operations into their service-bearing networks. Bringing IT vendors into these transformations at a foundational level only makes sense in order to benefit from their insights and assets and culture. 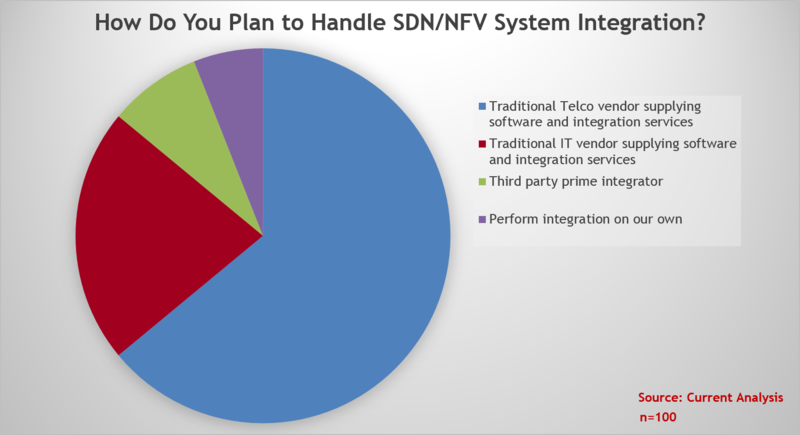 Will an SDN or NFV strategy fail without them? Probably not. Would it be better with them? Probably. Previous postNokia Analyst Conference – Automation Saved Managed Services, but Will That Work as Nokia Looks to Become a Leading SI?